The Russian Imperial Guard had its origins in the select group established by Peter the Great in the neighbourhood of Moscow in his youth. With this group as a starting point, the Body Guard Regiments of Preobrazhenski and Semenov were established in 1700, and the Regiment of Izmailova in 1730. Gradually the number of regiments increased. The highly esteemed Company of the Chevalier Guards was established in 1714 for ceremonial occasions, and was called the Army Coprs of the Chevalier Guards (1764-1766, 1799-1800), and from 1800 onwards the Regiment of the Chevalier Guards. As the Guard grew in size, it was formed into an Army Corps of the Guard in 1812. The Guard acted under several names, until its command was taken over by the general staff of St Petersburg military district in 1864. 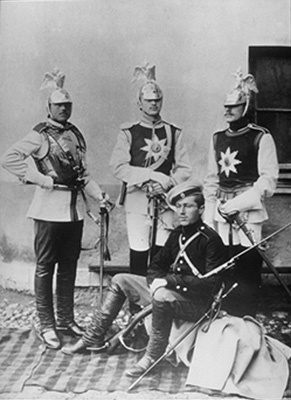 Towards the end of the 1800s, the Guard comprised 12 infantry regiments (in addition to the ones mentioned above, the regiments of Grenadiers, St Paul, Jägers, Finland, Moscow, Lithuania, Volhynia, Käkisalmi and St Petersburg), four sniper regiments of the Body Guard, 10 cavalry regiments of the Guard (Chevalier Guards, and the guards of Cavalry, Podolski Kyrassiers, Uhlans (2 regiments), Kyrassiers, Cavalry Grenadiers, Grodno Hussars, Hussars and Dragoons), and the Cossack Regiment of the Guard. Furthermore, two Grenadier Regiments (1. Jekaterinoslav and 13. 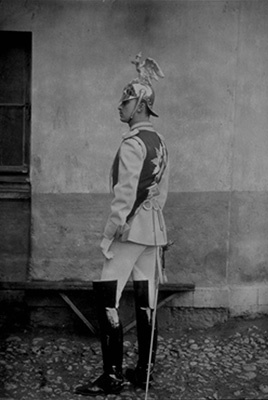 Jerivan), a Hussar Regiment (2. Pavlograd), two Dragoon Regiments (1. Moscow and 2. Pihkova) and a Uhlan Regiment (2. Kurland) were in the rank of the Body Guard. At the start of the First World War, the infantry of the Guard was divided into three Divisions of the Guard and the Sniper Division of the Guard; the cavalry into three Cavalry Divisions of the Guard. Two of the Cavalry Divisions were enlarged by a Sniper Regiment in 1916. A special Army Corps of the Guard had been formed in 1874; during the First World War, the Second Army Corps of the Guard (1915) and the Cavalry Corps of the Guard (1916) were established. The staff of the detachment of the Guards, formed on 12 November, 1915, took joint command, which in April 1916 passed over to the Army of the Guard. This was changed into a Special Army in August, 1916. The reinforcement detachments, the reserve regiments of the Russian Guard, stationed in St Petersburg during the world war, participated actively in the revolutions of 1917, and were abolished along with the rest of the army in March, 1918.